Mix chicken pieces together with chilly powder, turmeric powder, cumin powder, biriyani masala, salt and water. Transfer this to a pan and cook it until water dries up. When all the water dries up, add curry leaves and mix well. Very simple but looks like a Chinese recipe!! Yum!!! Innovative recipe... I'll try it too. 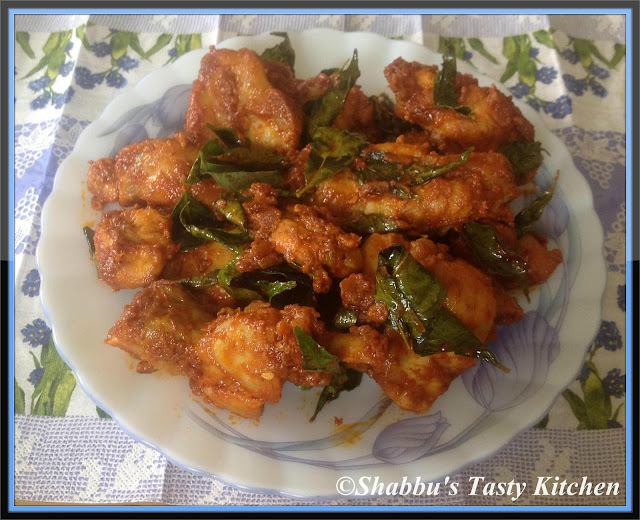 Easy delicious chicken..nice coating of masala in it,yummy! Super tempting and quick chicken sarkka,thanks for sharing. Looks so tasty and love this recipe! Quick and easy recipe,looks super tempting.